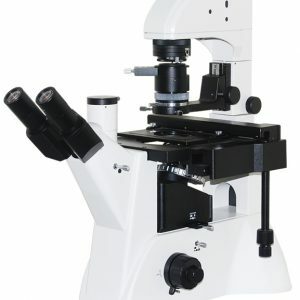 Microscopes are used today by people from mid / high school students to the scientists and in several fields. It is even used as a daily routine work by biologists, physicians / hospital laboratory, geologists, dentists / dental technicians, veterinarians, paleontologists, entomologists, gemologists, hair transplant, scientific researchers, quality control personnel, quality assurance, assemblers, forensic document examiners, art restoration, textile specialists, wire and die manufacturers, environmental specialists, ophthalmic specialists, dermatologists, metrology, tool & die, circuit board rework, horticultural experts, solar industry, exterminators, fish and wildlife, US / Canada / EU / Asia customs, semiconductor manufacturers, foresters, pharmaceutical, electroplating and so on. 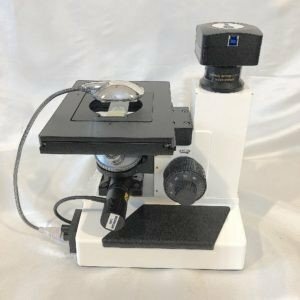 In this series of BIOIMAGER Microscope Tutorial, we like to discuss the all microscopy imaging modes that we hear / read a lot which includes Brightfield, Darkfield, Polarizing, Fluorescence, Phase Contrast, DIC Nomarski. Brightfield (BF) is the simplest imaging technique of all the optical microscopy imaging mode. As the name states you can expect an image with bright background. A simple example in our daily life is like seeing birds or airplane in the sky. 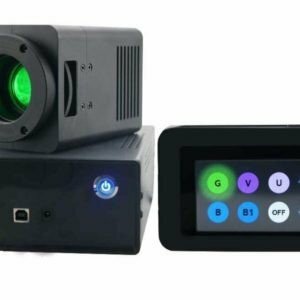 In BF imaging, a sample is normally illuminated via transmitted light coming from a white light and contrast in the sample is caused by the absorbance of some of transmitted light in dense areas of the sample. A type of optical microscopy techniques involving polarizing light. Simple techniques include illumination of the sample with polarized light. Directly transmitted light can, optionally, be blocked with a polarizer orientated at 90′ degrees to the illumination. more complex microscopy techniques which take advantage of polarized light include differential interference contrast (DIC Nomarski) microscopy and interference reflection microscopy. Polar: A device which produces plane polarized light from natural light. Plane-Polarized Light: Light with only on vibration direction present. Polarizer: A polar placed in the light path before the specimen. Analyzer: A polar place in the light path after the specimen. The analyzer is removable from the light path and may be rotatable. The analyzer is used to determine the optical effects produced by the specimen either in plane or polarized light. 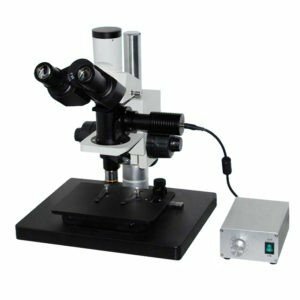 Strain Free: A term used to signify that microscope objectives and condenser lenses are selected to have a minimum amount of internal stress in the glass. Strain-free optics offers little or no contribution to the optical path difference of the specimen. Bertrand Lens: The Bertrand lens is located above the analyzer. the eyepiece and Bertrand lens act as a system to focus on the back image plane of the objective. The Bertrand lens’ main function is to view interference figures (conoscopic images) which appear in the back image plane of the objective when the specimen is viewed between crossed polars using highly convergent light from the condenser. Birefringence: A quantitative expression of the separation of a light beam as it penetrates a doubly refracting object into two diverging beams. Conoscopic Figure: A pattern consisting of isogyres and/or isochromatic curves formed in the back image plane of the objective also referred to as an interference figure. Conoscopic Observation: Observation of the back focal plane of a light microscope objective with a Bertrand lens or phase telescope, using a cone of light from the condenser. PleoChroism: A property exhibited by certain crystals of absorbing selectively various wavelengths of light and displaying different colors when looked at in the directions of their various crystal axes. In optical microscopy, darkfield describes microscopy methods, in both light and electron microscopy, which exclude the unscattered beam from the image. As a result, the field around the specimen is generally dark. 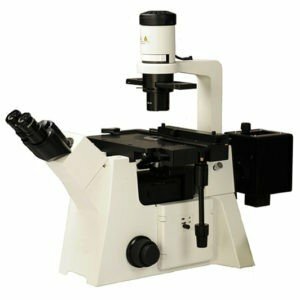 Darkfield microscopy is a very simple yet effective technique and well suited for uses involving live and unstained biological samples, such as a smear from a tissue culture or individual, water-borne, single-celled organisms. Darkfield optics are a low-cost alternative to phase contrast optics. 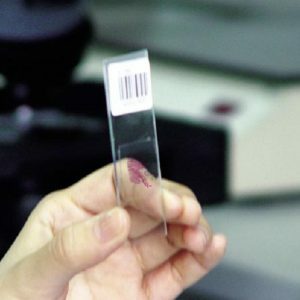 Transparent Specimens – Bacteria, spermatozoa, cells in glass containers, protozoa, mites, fibers, etc.